SMI wins the "China Awards 2011"
SMI S.p.A. has been awarded a prize in the "Top Investors in China 2011" section of the sixth edition of China Awards, an event organized by the Italy China Foundation in collaboration with Milano Finanza, with the partnership of the Italian Chamber of Commerce in China and under the patronage of the Italy-China Chamber of Commerce. The China Awards are annual prize-givings for the Italian companies who have best seized the opportunities of the market development in China and for the Chinese companies who have distinguished theirselves in Italy. The prizes, divided into seven categories, have been awarded by a panel chaired by Cesare Romiti (President of the Italy-China Foundation) and Paolo Panerai (Vice President and Managing Director of Classeditori), and made up of Gabriele Capolino (Director and Associate Editor MF-Milano Finanza), Franco Cutrupia (President of the Italian Chamber of Commerce in China), Osvaldo De Paolini (Director of MF-Milano Finanza), Giancarlo Lanna (President of Simest), Marco Mutinelli (Professor of Business Management at the University of Brescia), Pasquale Natuzzi (President of Natuzzi), Mario Zanone Poma (President of the Italy-China Chamber of Commerce). The "Top Investors in China" award is dedicated to the Italian companies who have significantly invested in China in 2011. 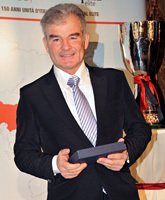 The prize was collected on 24 November 2011 by Ennio Nava, managing director of SMI, during a charity dinner at Hotel Principe di Savoia in Milan whose proceeds have been donated to Lifeline Express, a non-profit organization offering free medical care and surgical operations thanks to hospital trains which travel in the more isolated and poorest regions of China. With more than 4,000 machines installed all over the world and a turnover of 83.3 millions Euros in 2010, SMI is among the worldwide leaders in the manufacturing of high-tech packaging machines and bottling plants chiefly for the food & beverage market. In China SMI is present through two representative offices, located in the big industrial hubs of Nanjing and Guangzhou, offering both sales and after-sales technical assistance to the over 500 machines installed in the country. Thanks to a highly specialized local staff, SMI is constantly engaged in giving its customers a more and more efficient support, suitable to the specific demands of a market in continuous evolution. With this policy and in order to contribute to the process of modernization of many bottling plants in China through its hi-tech machines, SMI has decided to further strengthen its presence with the opening in Beijing of the subsidiary SMI Machinery Beijing Co. Ltd.